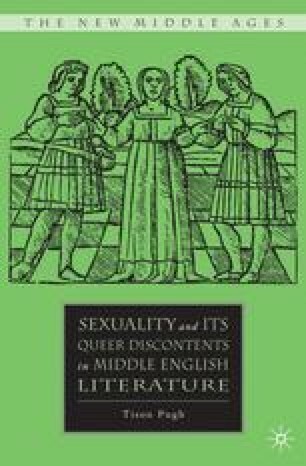 Medieval romances illustrate the ways in which culturally dominant paradigms of sexual identity structure and confine human relationships, thus exposing their audiences to sexuality’s often coercive ideological force.1 Anna Klosowska remarks that “romance is, to a good extent, a narrative that legitimates a symbolic order, a narrative that… legitimizes institutions,”2 and sexuality serves as a primary measure of romance’s ideological complicity with legitimating dominant modes of authority. The power of normative sexuality thus lies in its inextricable links to dominant modes of discourses, including those of politics, theology, and literature. An agonistic genre, romance narratives frequently depict knights fighting one another in battles and tournaments to prove their relative merits vis-à-vis one another and thus to win the praise of their female beloveds. Through the romance’s combination of the amatory and the martial, readers readily discern the ideological function of romance sexuality in that these narratives teach men the necessary values of masculinist and heteronormative western culture, including bravery, strength, honor, and fidelity. A corresponding critical lesson in this regard is that knights need both enemies and women if they are to define themselves as sufficiently masculine.